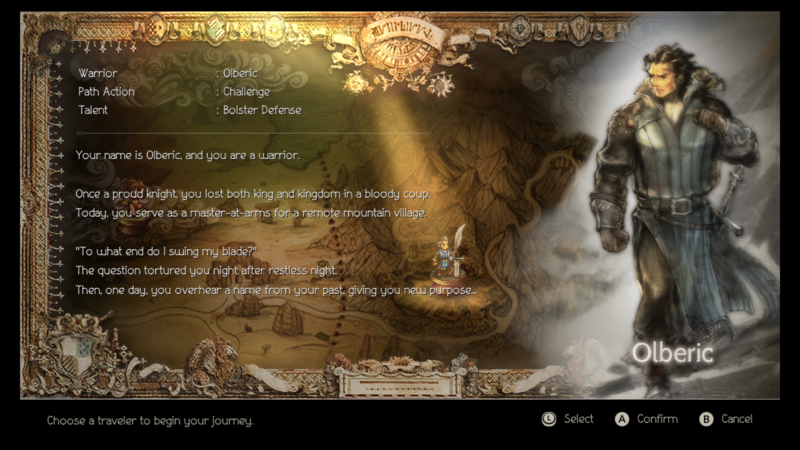 Octopath Traveler gives you the option to choose from eight distinct characters at the start of your journey, all with their own advantages, disadvantages, and abilities. While some characters are better to pick up than others, each one can hold their own in combat and prove vital to your squad. Which characters you choose to play with for the majority of the campaign, however, all comes down to personal preference. You can create a team of four that's well suited for battle and relies on items to heal you, or you can create a magic-based team that deals tons of elemental damage over a short period of time, but is always open to taking fatal damage. Depending on your personal playstyle, each character can provide something different. In order to help you create the best party possible, we've put together this list of all the characters' strengths and weaknesses to give you ample time to plan before you set foot into the world. 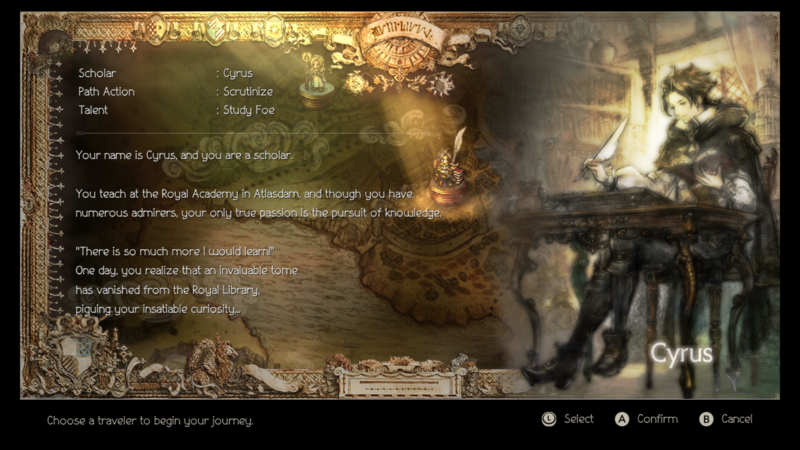 Alfyn is a resilient character who can offer a lot of utility to your team through his alchemy ability. He starts with a basic first aid ability that can heal your party, as well as an Ice elemental attack. His unique ability, Concoct, gives Alfyn the option of mixing different types of items together to create new ones, which cure the party or deal damage and status effects to enemies. There's no telling what each one will do, however, so learning all of the combinations is vital to success. 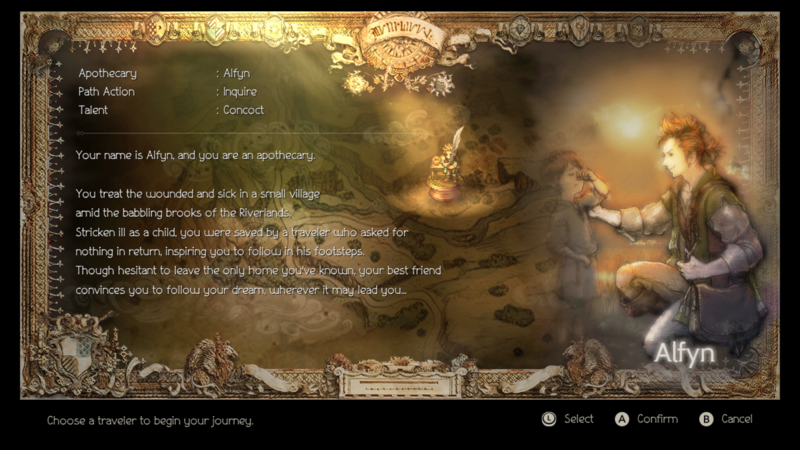 With Alfyn, you want your first two unlocked skills to be Vivfy, which revives someone in your party, and Rehabilitate, which cures a single ally of all their status ailments. In the early portions of the game, characters will die many times if you don't have an abundance of items because they'll be inflicted by poison, confusion, and other ailments. By taking these two abilities first, however, you'll have the tools needed to heal your party at any time, regardless of whether Alfyn is in your active party. 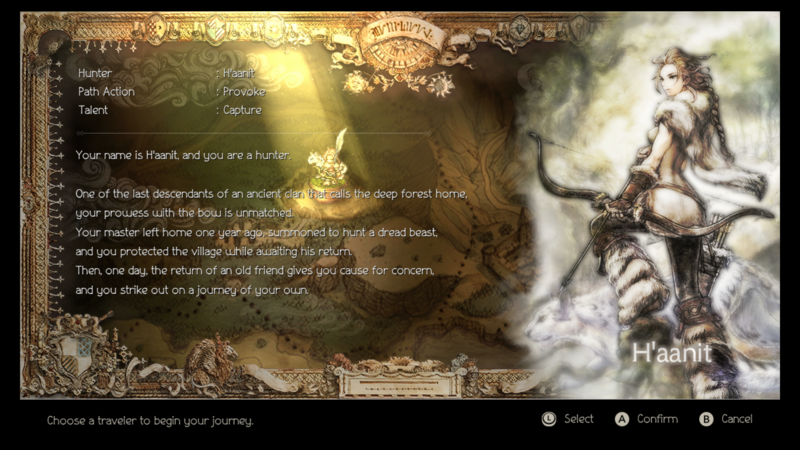 Cyrus is the basic mage in Octopath Traveler and he can use an abundance of different spells that are useful against most enemies. He's limited to Fire, Ice, and Lightning-type magic and also has skills that can be useful to the entire team. For instance, the first skill you should always unlock as Cyrus is Analyze, since it reveals the HP and one weakness of a single foe. This will give you an idea of what you need to do to beat a boss character, for example, as well as what to use against them. Cyrus is SP reliant, however, so keeping him stocked with SP recovery items is essential for some of the later stages of the game. He's also a very weak character, so taking too much damage would be a death sentence. Pairing him with other characters that can draw in damage, keep him healed, and essentially keep him alive is vital to making the most out of Cyrus' abilities. As a hunter, H'annit specializes in ranged and axe-based combat, but she has arguably one of the most useful abilities in the entire game when it comes to combat—Summoning. You're given the ability right from the get-go to capture weakened enemies in battle and you can then summon them whenever you feel like it to unleash their attacks on enemy forces. You're constantly micromanaging your creatures, changing them out as you progress through the game for more powerful ones. H'aanit's abilities mainly revolve around the Summoning mechanic and giving the party a chance to deal critical hits to opposing forces. This makes her a vital part of your party due to the variety in her kit as your main or secondary damage dealer. Arrowstorm, an attack that fires arrows at all enemies on the opposing side of the field, and True Strike, which guarantees a critical hit to one enemy when using the Bow, are arguably the best abilities to take at the start—but all of her abilities are useful. Simple to learn, hard to master—Olberic is the main damage dealer and tank of the team and he's an essential part of your lineup. He's the perfect character for newcomers to the JRPG series and for those looking to start the game with a strong amount of damage to help them in the later portions. His entire skill set is based around damage and taking hits for allies. Be sure to equip Olberic with your best defensive and offense items to guarantee your party's survival. Although he's tanky, Olberic isn't invulnerable—so be sure to keep him healthy. The first skills you want to take as Olberic are Cross Strike, which deals a hefty amount of damage to a single foe, and Incite, which draws enemies to attack Olberic for three turns. This will give you a good damage ability and pull enemy fire to Olberic if you need to heal up the rest of your party. 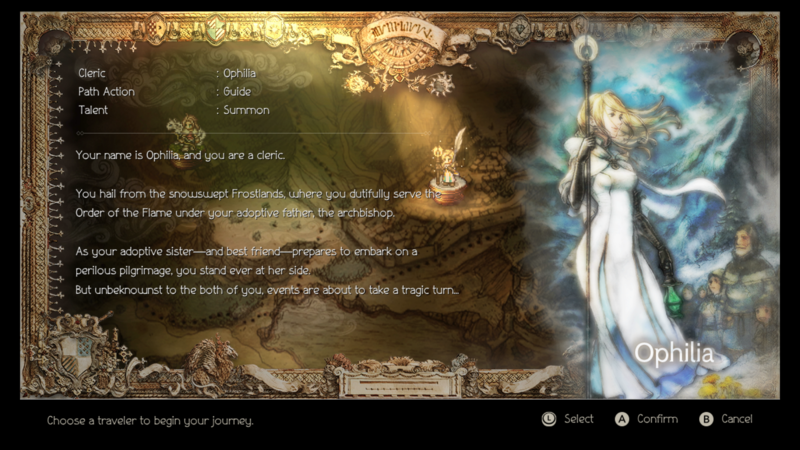 Ophilia is the token Cleric of any JRPG team, and she comes with a variety of healing spells and holy damage attacks. She isn't a complex character, which makes her ideal for beginners, but Ophilia should be saved as the second or third character you pick up on your quest because she's more of a support than a damage dealer. Just like Cyrus, Ophillia is very SP dependent and requires constant potions during prolonged adventures and fights. She's also incredibly weak, so having allies that can shift enemy focus to them, like Olberic, is vital to keeping her alive. The first skill you should pick up is Luminescence, an attack that deals light holy damage to every foe on the opposing side. This attack is just so crucial in the early game that it's not worth missing out on. You then want to either get Heal More, which restores health to your entire party, or Revive, which, as you can guess, revives a character after they die. 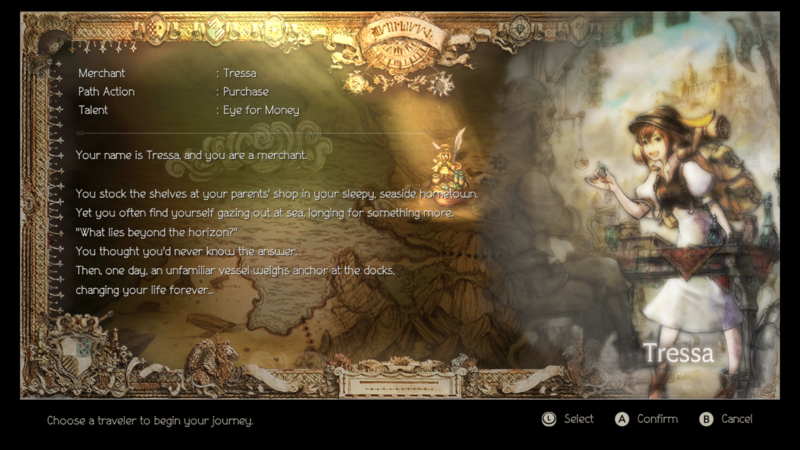 Primrose is one of the game's most advanced characters and she's mainly used to cure ailments and assist the team. When using her abilities, you want to be constantly debuffing enemies while buffing your allies and timing each one of your dances to help your team as much as possible. She's not the best fighter in the game and she's really only there to give your team an edge over the opposition. 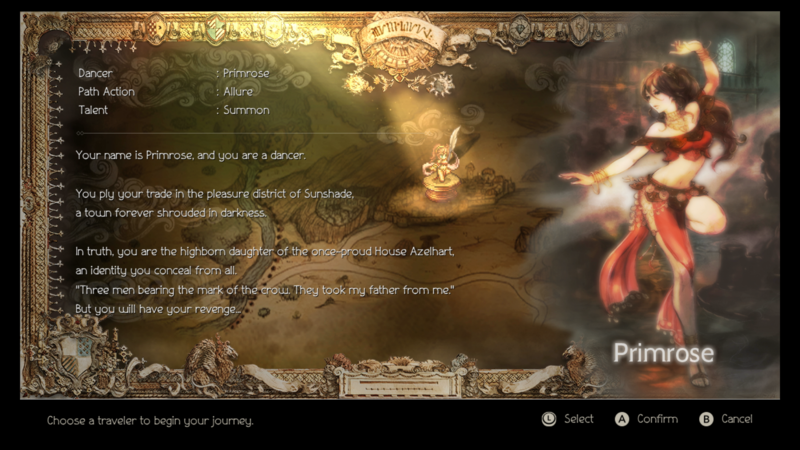 It might be best to save Primrose for last, however, unless you seriously want a challenge—you might want to learn the game and how everything works before throwing yourself into the deep end. Night Ode is an essential first skill since it deals dark elemental damage to every foe instead of just one. In the early game, you want to be defeating enemies as quickly as possible to get experience—and this will help you to do just that. 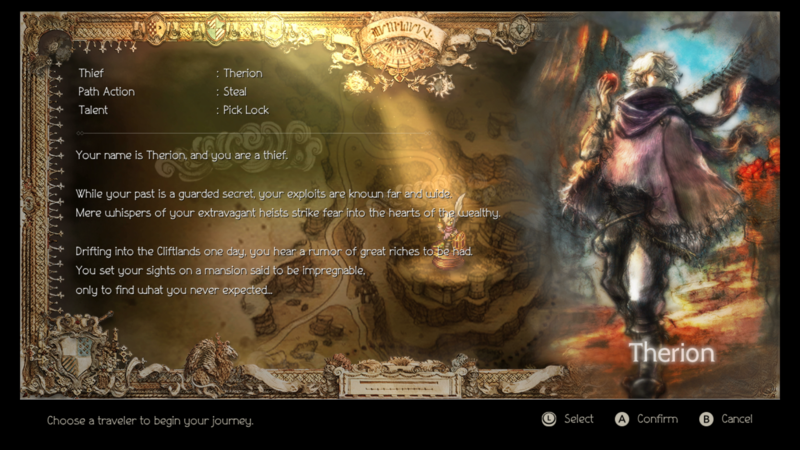 Therion is a character best saved for the later game. He has a ton of abilities that can give you the skills to pickpocket townspeople to gain items and unlock bright purple chests littered around the world—but his skills on the battlefield leave much to be desired. Therion's utility comes from what he can do outside of battle, though. His early game is incredibly weak and he should be picked up later when you have more characters who can keep him alive during his story missions. If you do plan to pick up Therion, however, then you might want to take HP Thief as your first skill. The skill gives you the option to steal health from a foe after a successful attack, keeping you alive in battle longer. Steal SP should then be taken after—it does the same as HP Thief, but gives you SP to use more special moves. Tressa basically acts as your jack-of-all-trades character who can deal ranged and melee damage, as well as offer some sweet elemental assistance and self-healing abilities. Being good at everything, however, has its disadvantages. She doesn't really hit hard with all of her abilities and she has moderate health and defense at best. She is, however, a very beginner-friendly character because of her skillset—she can give players different options in battle right from the get-go. Tressa's best ability, however, is her class-specific one. She has the option to walk up to any NPC and haggle for deals. If you're lucky, you can snag some rare items for bargain prices, saving you a trip to the overpriced store. Just like Primrose, you want to invest in a magic attack that can deal damage to all foes as your first ability—which, in this case, is the wind elemental attack, Trade Tempest. You then want to invest in Rest, which can heal Tressa's HP and SP during battle—and it costs zero SP.